The late President of Iraq, Saddam Hussein, had this belief that he was a reincarnation of the ancient King of Babylon, Nebuchadnezzar. In his desire to make this belief public, he ordered that the archaeologists and construction workers restoring the ancient city of Babylon replace every other image of Nebuchadnezzar embedded in the walls with a similar style image of himself. Who was Nebuchadnezzar and what can we learn from him? Humanly speaking, Nebuchadnezzar, also sometimes spelled Nebuchadrezzar, was perhaps the greatest and most powerful king in Babylonian history. He was noted for his victories over the Egyptians who had conquered and occupied Assyria and Israel. It was his victory over the Israelites in Jerusalem that led to the city being destroyed and the Israelites being carried away to Babylon as slaves (2 Kings 24-25; Daniel 1, Jeremiah 40; Jeremiah 46). In addition to Nebuchadnezzar’s military prowess, he was a master at building the city of Babylon into a modern wonder of engineering and architecture. However, as a heathen king, he was also led astray by a belief and practice in idolatry (Daniel 1-3). This led him to seek people with occult type powers to interpret dreams, issue swift judgment and condemnation of others, and elevate or exalt anyone that he saw as a benefit to himself. Nebuchadnezzar was essentially the representation of everything that embodies human sinfulness driven by the lust of the flesh, lust of the eyes, and pride. 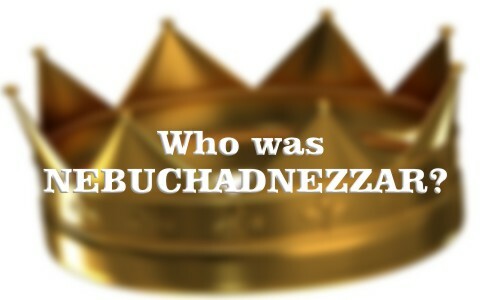 What were the influences that affected Nebuchadnezzar? It is obvious that Nebuchadnezzar’s idolatrous and pagan upbringing and experiences led him to become the man that he was. However, since Nebuchadnezzar carried away the Israelites from Jerusalem, he found himself surrounded by Hebrews that still were faithful to God. These Hebrews, blessed by God, demonstrated to Nebuchadnezzar that there was a real God that was directly involved in the affairs of His people. When Nebuchadnezzar ordered everyone to worship a golden statue and three Hebrews, Hananiah, Mishael, and Azariah, (renamed Shadrach, Meshach; and Abednego) refused, Nebuchadnezzar ordered them thrown into a fiery furnace. God demonstrated His power by protecting them and even allowing the king to see a pre-incarnate image of Christ walking inside the furnace with them. When the king called the three out, they walked out without any effects of the fire to their bodies. This miracle convinced Nebuchadnezzar to praise God and protect God’s people (Daniel 3:1-4:3). When Nebuchadnezzar’s magicians could not interpret a dream, God gave the interpretation to Daniel. The interpretation of the king losing his kingdom and becoming insane terrified the king. The king lapsed into literal insanity and did things that Daniel had said from the dream would happen. However, after a year of living in insanity God reminded Him of the interpretation and restored Nebuchadnezzar’s sanity and his kingdom. God restored Nebuchadnezzar’s kingdom to him, demonstrating that God has the power as King of kings and Lord of lords to lift up and throw down kings and kingdoms (Daniel 4). Finally, Nebuchadnezzar came to realize that God was real and a rewarder of those that diligently seek Him (Hebrews 11:6). He responded to God’s demonstrations of power and glory by praising God and proclaiming God’s glory (Daniel 4:34-37). What can we learn from Nebuchadnezzar? As believers, we can learn that even though we live in the midst of wickedness and perversion, our faithfulness to God has great influence on those around us. For some, they will insist that we adhere to their ways and practices that are contrary to the Word of God. When we persist, they will persecute and even seek our death for not accepting their beliefs and practices. However, it is during these times of persecution that God demonstrates that He has not left nor forsaken us. Like Nebuchadnezzar, others will see things in God’s people that demonstrate God’s power, provision, and blessing. In times of need or distress, they will seek out God’s people for answers that the world cannot provide. When this happens and God’s people seek His will for their actions amongst non-believers, then miraculous things happen. Often these miraculous things take the form of unexpected help and outcomes, provision in times of need, and a clarity of understanding and wisdom in the midst of turmoil. All of these things serve to demonstrate to the real world, why we have faith in a God that the god of this world has blinded them to. When they see these things, it opens their eyes to the truth so that they, like Nebuchadnezzar, can come to see God the way that we do. It is important that as believers, we remember that we present a testimony to the world. We must also keep in mind that our testimony can be good or bad, which will influence people not only in the here and now, but for eternity. Humanly speaking, Nebuchadnezzar was perhaps the greatest and most powerful king in Babylonian history. It is obvious that Nebuchadnezzar’s idolatrous and pagan upbringing and experiences led him to become the man that he was. However, he found himself surrounded by Hebrews that were faithful to God. Through their faith, and God’s intervention in their situations, the Hebrews served as witnesses to God’s existence and glory. As believers, our testimony also has a positive or negative effect on those around us. It is up to us, which testimony we leave. Next post: What Is The Guff?